Today I have a guest post from Bad Playdate. Enjoy. When I was single I had bad dates in bars and restaurants, now I take my kids on bad playdates at places like animal shelters and a lobster tank at the grocery store. As you can see from the stories on Bad Playdate, bad playdates can happen anywhere. I now present you with my 5 worst. An innocent playdate in a driveway can become uncomfortable and dangerous when a nanny gets yelled at by her circus hating boss for making a chalk drawing of a clown. When the defeated nanny throws scalding hot water all over her drawing to wash it away, the playdate gets real. It can become uncomfortable when another mom asks you over for a playdate on a cold day and she keeps you outside because her housekeeper just left and she doesn’t want you wrecking her clean house. A shopping trip disguised as a playdate can get ugly and competitive when another mom scolds you for unfolding too many shirts when you’re trying to find your size and then makes a scene by refolding every shirt in a frenzy while the kids go wild. Things can get boring on a playdate at the grocery store lobster tank so be ready to move the playdate to the Starbucks a few feet away. Then when another mom taunts you for paying Starbucks prices for a milk box, you might feel confused. You might think a trip to a local animal shelter would be a fun playdate for the kids, until another mom, who is thinking about adopting a morbidly obese cat named Flounder, scares the children by hanging onto the cat for dear life and terrifying it. 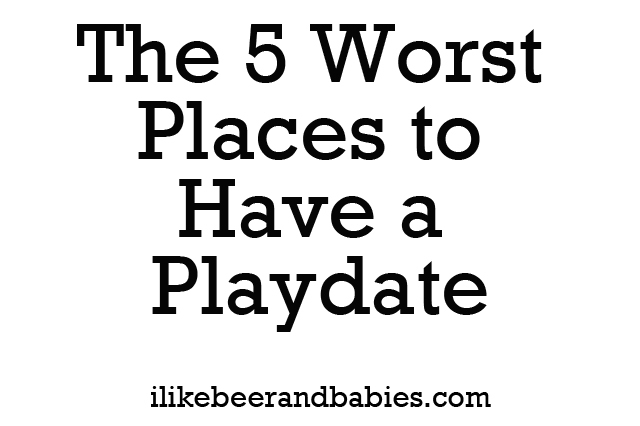 For the full story on all 5 of these bad playdates, head on over to Bad Playdate. You can also follow Bad Playdate on Twitter and Facebook.